1 B None No Power Seat 1 B is a standard Business Premier seat however, the proximity to the galley may be bothersome. 1 J None No Power Seat 1 J is a standard Business Premier seat however, the proximity to the galley may be bothersome. 2 A None No Power Seat 2 A is a standard Business Premier seat. 2 B None No Power Seat 2 B is a standard Business Premier seat. 2 J None No Power Seat 2 J is a standard Business Premier seat. 2 K None No Power Seat 2 K is a standard Business Premier seat. 23 A None No Power Seat 23 A is a Premium Economy Bulkhead seat that has bassinet access, but whose proximity to the lavatory and galley may be bothersome. The tray table is in the armrest, making the armrest immovable and slightly reducing seat width. There is no floor storage for this seat during take-off and landing. 23 B None No Power Seat 23 B is a Premium Economy Bulkhead seat whose proximity to the lavatory and galley may be bothersome. The tray table is in the armrest, making the armrest immovable and slightly reducing seat width. There is no floor storage for this seat during take-off and landing. 23 D None No Power Seat 23 D is a Premium Economy Bulkhead seat whose proximity to the lavatory and galley may be bothersome. The tray table is in the armrest, making the armrest immovable and slightly reducing seat width. There is no floor storage for this seat during take-off and landing. 23 E None No Power Seat 23 E is a Premium Economy Bulkhead seat whose proximity to the lavatory and galley may be bothersome. The tray table is in the armrest, making the armrest immovable and slightly reducing seat width. There is no floor storage for this seat during take-off and landing. 23 F None No Power Seat 23 F is a Premium Economy Bulkhead seat whose proximity to the lavatory and galley may be bothersome. The tray table is in the armrest, making the armrest immovable and slightly reducing seat width. There is no floor storage for this seat during take-off and landing. 23 G None No Power Seat 23 G is a Premium Economy Bulkhead seat whose proximity to the lavatory and galley may be bothersome. The tray table is in the armrest, making the armrest immovable and slightly reducing seat width. There is no floor storage for this seat during take-off and landing. 23 J None No Power Seat 23 J is a Premium Economy Bulkhead seat whose proximity to the lavatory and galley may be bothersome. The tray table is in the armrest, making the armrest immovable and slightly reducing seat width. There is no floor storage for this seat during take-off and landing. 23 K None No Power Seat 23 K is a Premium Economy Bulkhead seat that has bassinet access, but whose proximity to the lavatory and galley may be bothersome. The tray table is in the armrest, making the armrest immovable and slightly reducing seat width. There is no floor storage for this seat during take-off and landing. 24 B None No Power Seat 24 B is a standard Premium Economy seat. 24 J None No Power Seat 24 J is a standard Premium Economy seat. 25 B None No Power Seat 25 B is a standard Premium Economy seat. 25 J None No Power Seat 25 J is a standard Premium Economy seat. 26 B None No Power Seat 26 B is a standard Premium Economy seat. 26 J None No Power Seat 26 J is a standard Premium Economy seat. 27 A None No Power Seat 27 A is a standard Premium Economy seat. 27 B None No Power Seat 27 B is a standard Premium Economy seat. 27 D None No Power Seat 27 D is a standard Premium Economy seat. 27 E None No Power Seat 27 E is a standard Premium Economy seat. 27 F None No Power Seat 27 F is a standard Premium Economy seat. 27 G None No Power Seat 27 G is a standard Premium Economy seat. 27 J None No Power Seat 27 J is a standard Premium Economy seat. 27 K None No Power Seat 27 K is a standard Premium Economy seat. 3 A None No Power Seat 3 A is a standard Business Premier seat. 3 B None No Power Seat 3 B is a standard Business Premier seat. 3 J None No Power Seat 3 J is a standard Business Premier seat. 3 K None No Power Seat 3 K is a standard Business Premier seat. 35 A None No Power Seat 35 A is a standard Economy Class seat however, the position of the bulkhead may be bothersome. The tray table is in the armrest, making the armrest immovable and slightly reducing seat width. 35 B None No Power Seat 35 B is a standard Economy Class seat however, the position of the bulkhead may be bothersome. The tray table is in the armrest, making the armrest immovable and slightly reducing seat width. 35 C None No Power Seat 35 C is a standard Economy Class seat however, the position of the bulkhead may be bothersome. The tray table is in the armrest, making the armrest immovable and slightly reducing seat width. 35 D None No Power Seat 35 D is a standard Economy Class seat however, the position of the bulkhead may be bothersome. The tray table is in the armrest, making the armrest immovable and slightly reducing seat width. 35 E None No Power Seat 35 E is a standard Economy Class seat however, the position of the bulkhead may be bothersome. The tray table is in the armrest, making the armrest immovable and slightly reducing seat width. 35 F None No Power Seat 35 F is a standard Economy Class seat however, the position of the bulkhead may be bothersome. The tray table is in the armrest, making the armrest immovable and slightly reducing seat width. 35 G None No Power Seat 35 G is a standard Economy Class seat however, the position of the bulkhead may be bothersome. The tray table is in the armrest, making the armrest immovable and slightly reducing seat width. 35 H None No Power Seat 35 H is a standard Economy Class seat however, the position of the bulkhead may be bothersome. The tray table is in the armrest, making the armrest immovable and slightly reducing seat width. 35 J None No Power Seat 35 J is a standard Economy Class seat however, the position of the bulkhead may be bothersome. The tray table is in the armrest, making the armrest immovable and slightly reducing seat width. 35 K None No Power Seat 35 K is a standard Economy Class seat however, the position of the bulkhead may be bothersome. The tray table is in the armrest, making the armrest immovable and slightly reducing seat width. 36 A None No Power Seat 36 A is a standard Economy Class seat which when purchased with the two adjacent seats may be converted to the Economy Skycouch. An extendable foot rest for all three seats is raised to create a couch-like seat providing a unique personal space with added comfort on long-haul flights. The seat pitch in this row is 33 inches. 36 B None No Power Seat 36 B is a standard Economy Class seat which when purchased with the two adjacent seats may be converted to the Economy Skycouch. An extendable foot rest for all three seats is raised to create a couch-like seat providing a unique personal space with added comfort on long-haul flights. The seat pitch in this row is 33 inches. 36 C None No Power Seat 36 C is a standard Economy Class seat which when purchased with the two adjacent seats may be converted to the Economy Skycouch. An extendable foot rest for all three seats is raised to create a couch-like seat providing a unique personal space with added comfort on long-haul flights. The seat pitch in this row is 33 inches. 36 H None No Power Seat 36 H is a standard Economy Class seat which when purchased with the two adjacent seats may be converted to the Economy Skycouch. An extendable foot rest for all three seats is raised to create a couch-like seat providing a unique personal space with added comfort on long-haul flights. The seat pitch in this row is 33 inches. 36 J None No Power Seat 36 J is a standard Economy Class seat which when purchased with the two adjacent seats may be converted to the Economy Skycouch. An extendable foot rest for all three seats is raised to create a couch-like seat providing a unique personal space with added comfort on long-haul flights. The seat pitch in this row is 33 inches. 36 K None No Power Seat 36 K is a standard Economy Class seat which when purchased with the two adjacent seats may be converted to the Economy Skycouch. An extendable foot rest for all three seats is raised to create a couch-like seat providing a unique personal space with added comfort on long-haul flights. The seat pitch in this row is 33 inches. 37 A None No Power Seat 37 A is a standard Economy Class seat which when purchased with the two adjacent seats may be converted to the Economy Skycouch. An extendable foot rest for all three seats is raised to create a couch-like seat providing a unique personal space with added comfort on long-haul flights. The seat pitch in this row is 33 inches. 37 B None No Power Seat 37 B is a standard Economy Class seat which when purchased with the two adjacent seats may be converted to the Economy Skycouch. An extendable foot rest for all three seats is raised to create a couch-like seat providing a unique personal space with added comfort on long-haul flights. The seat pitch in this row is 33 inches. 37 C None No Power Seat 37 C is a standard Economy Class seat which when purchased with the two adjacent seats may be converted to the Economy Skycouch. An extendable foot rest for all three seats is raised to create a couch-like seat providing a unique personal space with added comfort on long-haul flights. The seat pitch in this row is 33 inches. 37 H None No Power Seat 37 H is a standard Economy Class seat which when purchased with the two adjacent seats may be converted to the Economy Skycouch. An extendable foot rest for all three seats is raised to create a couch-like seat providing a unique personal space with added comfort on long-haul flights. The seat pitch in this row is 33 inches. 37 J None No Power Seat 37 J is a standard Economy Class seat which when purchased with the two adjacent seats may be converted to the Economy Skycouch. An extendable foot rest for all three seats is raised to create a couch-like seat providing a unique personal space with added comfort on long-haul flights. The seat pitch in this row is 33 inches. 37 K None No Power Seat 37 K is a standard Economy Class seat which when purchased with the two adjacent seats may be converted to the Economy Skycouch. An extendable foot rest for all three seats is raised to create a couch-like seat providing a unique personal space with added comfort on long-haul flights. The seat pitch in this row is 33 inches. 38 A None No Power Seat 38 A is a standard Economy Class seat which when purchased with the two adjacent seats may be converted to the Economy Skycouch. An extendable foot rest for all three seats is raised to create a couch-like seat providing a unique personal space with added comfort on long-haul flights. The seat pitch in this row is 33 inches. 38 B None No Power Seat 38 B is a standard Economy Class seat which when purchased with the two adjacent seats may be converted to the Economy Skycouch. An extendable foot rest for all three seats is raised to create a couch-like seat providing a unique personal space with added comfort on long-haul flights. The seat pitch in this row is 33 inches. 38 C None No Power Seat 38 C is a standard Economy Class seat which when purchased with the two adjacent seats may be converted to the Economy Skycouch. An extendable foot rest for all three seats is raised to create a couch-like seat providing a unique personal space with added comfort on long-haul flights. The seat pitch in this row is 33 inches. 38 H None No Power Seat 38 H is a standard Economy Class seat which when purchased with the two adjacent seats may be converted to the Economy Skycouch. An extendable foot rest for all three seats is raised to create a couch-like seat providing a unique personal space with added comfort on long-haul flights. The seat pitch in this row is 33 inches. 38 J None No Power Seat 38 J is a standard Economy Class seat which when purchased with the two adjacent seats may be converted to the Economy Skycouch. An extendable foot rest for all three seats is raised to create a couch-like seat providing a unique personal space with added comfort on long-haul flights. The seat pitch in this row is 33 inches. 38 K None No Power Seat 38 K is a standard Economy Class seat which when purchased with the two adjacent seats may be converted to the Economy Skycouch. An extendable foot rest for all three seats is raised to create a couch-like seat providing a unique personal space with added comfort on long-haul flights. The seat pitch in this row is 33 inches. 39 A None No Power Seat 39 A is a standard Economy Class seat which when purchased with the two adjacent seats may be converted to the Economy Skycouch. An extendable foot rest for all three seats is raised to create a couch-like seat providing a unique personal space with added comfort on long-haul flights. The seat pitch in this row is 33 inches. 39 B None No Power Seat 39 B is a standard Economy Class seat which when purchased with the two adjacent seats may be converted to the Economy Skycouch. An extendable foot rest for all three seats is raised to create a couch-like seat providing a unique personal space with added comfort on long-haul flights. The seat pitch in this row is 33 inches. 39 C None No Power Seat 39 C is a standard Economy Class seat which when purchased with the two adjacent seats may be converted to the Economy Skycouch. An extendable foot rest for all three seats is raised to create a couch-like seat providing a unique personal space with added comfort on long-haul flights. The seat pitch in this row is 33 inches. 39 H None No Power Seat 39 H is a standard Economy Class seat which when purchased with the two adjacent seats may be converted to the Economy Skycouch. An extendable foot rest for all three seats is raised to create a couch-like seat providing a unique personal space with added comfort on long-haul flights. The seat pitch in this row is 33 inches. 39 J None No Power Seat 39 J is a standard Economy Class seat which when purchased with the two adjacent seats may be converted to the Economy Skycouch. An extendable foot rest for all three seats is raised to create a couch-like seat providing a unique personal space with added comfort on long-haul flights. The seat pitch in this row is 33 inches. 39 K None No Power Seat 39 K is a standard Economy Class seat which when purchased with the two adjacent seats may be converted to the Economy Skycouch. An extendable foot rest for all three seats is raised to create a couch-like seat providing a unique personal space with added comfort on long-haul flights. The seat pitch in this row is 33 inches. 4 A None No Power Seat 4 A is a standard Business Premier seat. 4 B None No Power Seat 4 B is a standard Business Premier seat. 4 J None No Power Seat 4 J is a standard Business Premier seat. 4 K None No Power Seat 4 K is a standard Business Premier seat. 40 A None No Power Seat 40 A is a standard Economy Class seat which when purchased with the two adjacent seats may be converted to the Economy Skycouch. An extendable foot rest for all three seats is raised to create a couch-like seat providing a unique personal space with added comfort on long-haul flights. The seat pitch in this row is 33 inches. 40 B None No Power Seat 40 B is a standard Economy Class seat which when purchased with the two adjacent seats may be converted to the Economy Skycouch. An extendable foot rest for all three seats is raised to create a couch-like seat providing a unique personal space with added comfort on long-haul flights. The seat pitch in this row is 33 inches. 40 C None No Power Seat 40 C is a standard Economy Class seat which when purchased with the two adjacent seats may be converted to the Economy Skycouch. An extendable foot rest for all three seats is raised to create a couch-like seat providing a unique personal space with added comfort on long-haul flights. The seat pitch in this row is 33 inches. 40 H None No Power Seat 40 H is a standard Economy Class seat which when purchased with the two adjacent seats may be converted to the Economy Skycouch. An extendable foot rest for all three seats is raised to create a couch-like seat providing a unique personal space with added comfort on long-haul flights. The seat pitch in this row is 33 inches. 40 J None No Power Seat 40 J is a standard Economy Class seat which when purchased with the two adjacent seats may be converted to the Economy Skycouch. An extendable foot rest for all three seats is raised to create a couch-like seat providing a unique personal space with added comfort on long-haul flights. The seat pitch in this row is 33 inches. 40 K None No Power Seat 40 K is a standard Economy Class seat which when purchased with the two adjacent seats may be converted to the Economy Skycouch. An extendable foot rest for all three seats is raised to create a couch-like seat providing a unique personal space with added comfort on long-haul flights. The seat pitch in this row is 33 inches. 41 A None No Power Seat 41 A is a standard Economy Class seat which when purchased with the two adjacent seats may be converted to the Economy Skycouch. An extendable foot rest for all three seats is raised to create a couch-like seat providing a unique personal space with added comfort on long-haul flights. The seat pitch in this row is 33 inches. 41 B None No Power Seat 41 B is a standard Economy Class seat which when purchased with the two adjacent seats may be converted to the Economy Skycouch. An extendable foot rest for all three seats is raised to create a couch-like seat providing a unique personal space with added comfort on long-haul flights. The seat pitch in this row is 33 inches. 41 C None No Power Seat 41 C is a standard Economy Class seat which when purchased with the two adjacent seats may be converted to the Economy Skycouch. An extendable foot rest for all three seats is raised to create a couch-like seat providing a unique personal space with added comfort on long-haul flights. The seat pitch in this row is 33 inches. 41 H None No Power Seat 41 H is a standard Economy Class seat which when purchased with the two adjacent seats may be converted to the Economy Skycouch. An extendable foot rest for all three seats is raised to create a couch-like seat providing a unique personal space with added comfort on long-haul flights. The seat pitch in this row is 33 inches. 41 J None No Power Seat 41 J is a standard Economy Class seat which when purchased with the two adjacent seats may be converted to the Economy Skycouch. An extendable foot rest for all three seats is raised to create a couch-like seat providing a unique personal space with added comfort on long-haul flights. The seat pitch in this row is 33 inches. 41 K None No Power Seat 41 K is a standard Economy Class seat which when purchased with the two adjacent seats may be converted to the Economy Skycouch. An extendable foot rest for all three seats is raised to create a couch-like seat providing a unique personal space with added comfort on long-haul flights. The seat pitch in this row is 33 inches. 42 A None No Power Seat 42 A is a standard Economy Class seat which when purchased with the two adjacent seats may be converted to the Economy Skycouch. An extendable foot rest for all three seats is raised to create a couch-like seat providing a unique personal space with added comfort on long-haul flights. The seat pitch in this row is 33 inches. 42 B None No Power Seat 42 B is a standard Economy Class seat which when purchased with the two adjacent seats may be converted to the Economy Skycouch. An extendable foot rest for all three seats is raised to create a couch-like seat providing a unique personal space with added comfort on long-haul flights. The seat pitch in this row is 33 inches. 42 C None No Power Seat 42 C is a standard Economy Class seat which when purchased with the two adjacent seats may be converted to the Economy Skycouch. An extendable foot rest for all three seats is raised to create a couch-like seat providing a unique personal space with added comfort on long-haul flights. The seat pitch in this row is 33 inches. 42 H None No Power Seat 42 H is a standard Economy Class seat which when purchased with the two adjacent seats may be converted to the Economy Skycouch. An extendable foot rest for all three seats is raised to create a couch-like seat providing a unique personal space with added comfort on long-haul flights. The seat pitch in this row is 33 inches. 42 J None No Power Seat 42 J is a standard Economy Class seat which when purchased with the two adjacent seats may be converted to the Economy Skycouch. An extendable foot rest for all three seats is raised to create a couch-like seat providing a unique personal space with added comfort on long-haul flights. The seat pitch in this row is 33 inches. 42 K None No Power Seat 42 K is a standard Economy Class seat which when purchased with the two adjacent seats may be converted to the Economy Skycouch. An extendable foot rest for all three seats is raised to create a couch-like seat providing a unique personal space with added comfort on long-haul flights. The seat pitch in this row is 33 inches. 43 A None No Power Seat 43 A is a standard Economy Class seat which when purchased with the two adjacent seats may be converted to the Economy Skycouch. An extendable foot rest for all three seats is raised to create a couch-like seat providing a unique personal space with added comfort on long-haul flights. The seat pitch in this row is 33 inches. 43 B None No Power Seat 43 B is a standard Economy Class seat which when purchased with the two adjacent seats may be converted to the Economy Skycouch. An extendable foot rest for all three seats is raised to create a couch-like seat providing a unique personal space with added comfort on long-haul flights. The seat pitch in this row is 33 inches. 43 C None No Power Seat 43 C is a standard Economy Class seat which when purchased with the two adjacent seats may be converted to the Economy Skycouch. An extendable foot rest for all three seats is raised to create a couch-like seat providing a unique personal space with added comfort on long-haul flights. The seat pitch in this row is 33 inches. 43 H None No Power Seat 43 H is a standard Economy Class seat which when purchased with the two adjacent seats may be converted to the Economy Skycouch. An extendable foot rest for all three seats is raised to create a couch-like seat providing a unique personal space with added comfort on long-haul flights. The seat pitch in this row is 33 inches. 43 J None No Power Seat 43 J is a standard Economy Class seat which when purchased with the two adjacent seats may be converted to the Economy Skycouch. An extendable foot rest for all three seats is raised to create a couch-like seat providing a unique personal space with added comfort on long-haul flights. The seat pitch in this row is 33 inches. 43 K None No Power Seat 43 K is a standard Economy Class seat which when purchased with the two adjacent seats may be converted to the Economy Skycouch. An extendable foot rest for all three seats is raised to create a couch-like seat providing a unique personal space with added comfort on long-haul flights. The seat pitch in this row is 33 inches. 44 A None No Power Seat 44 A is a standard Economy Class seat which when purchased with the two adjacent seats may be converted to the Economy Skycouch. An extendable foot rest for all three seats is raised to create a couch-like seat providing a unique personal space with added comfort on long-haul flights. The seat pitch in this row is 33 inches. 44 B None No Power Seat 44 B is a standard Economy Class seat which when purchased with the two adjacent seats may be converted to the Economy Skycouch. An extendable foot rest for all three seats is raised to create a couch-like seat providing a unique personal space with added comfort on long-haul flights. The seat pitch in this row is 33 inches. 44 C None No Power Seat 44 C is a standard Economy Class seat which when purchased with the two adjacent seats may be converted to the Economy Skycouch. An extendable foot rest for all three seats is raised to create a couch-like seat providing a unique personal space with added comfort on long-haul flights. The seat pitch in this row is 33 inches. 44 H None No Power Seat 44 H is a standard Economy Class seat which when purchased with the two adjacent seats may be converted to the Economy Skycouch. An extendable foot rest for all three seats is raised to create a couch-like seat providing a unique personal space with added comfort on long-haul flights. The seat pitch in this row is 33 inches. 44 J None No Power Seat 44 J is a standard Economy Class seat which when purchased with the two adjacent seats may be converted to the Economy Skycouch. An extendable foot rest for all three seats is raised to create a couch-like seat providing a unique personal space with added comfort on long-haul flights. The seat pitch in this row is 33 inches. 44 K None No Power Seat 44 K is a standard Economy Class seat which when purchased with the two adjacent seats may be converted to the Economy Skycouch. An extendable foot rest for all three seats is raised to create a couch-like seat providing a unique personal space with added comfort on long-haul flights. The seat pitch in this row is 33 inches. 46 F None No Power Seat 46 F is a standard Economy Class seat whose proximity to the lavatories may be bothersome. 46 G None No Power Seat 46 G is a standard Economy Class seat whose proximity to the lavatories may be bothersome. 47 A None No Power Seat 47 A is an Economy Class seat that may have extra legroom due to the exit row in front, however the close proximity to the lavatories may be bothersome. This seat is missing a window. The tray table is in the armrest, making the armrest immovable and slightly reducing seat width. There is no floor storage for this seat during take-off and landing. 47 B None No Power Seat 47 B is an Economy Class seat that may have extra legroom due to the exit row in front, however the close proximity to the lavatories may be bothersome. The tray table is in the armrest, making the armrest immovable and slightly reducing seat width. There is no floor storage for this seat during take-off and landing. 47 J None No Power Seat 47 J is an Economy Class seat that may have extra legroom due to the exit row in front, however the close proximity to the lavatories may be bothersome. The tray table is in the armrest, making the armrest immovable and slightly reducing seat width. There is no floor storage for this seat during take-off and landing. 47 K None No Power Seat 47 K is an Economy Class seat that may have extra legroom due to the exit row in front, however the close proximity to the lavatories may be bothersome. This seat is missing a window. The tray table is in the armrest, making the armrest immovable and slightly reducing seat width. There is no floor storage for this seat during take-off and landing. 48 C None No Power Seat 48 C is an Economy Class seat that may have extra legroom due to the exit row in front, however the close proximity to the lavatories may be bothersome, and passengers may often congregate around or bump this seat during the flight. 48 D None No Power Seat 48 D is an Economy Class Bulkhead seat whose proximity to the lavatories may be bothersome. This center row of seats has two bassinet locations. The tray table is in the armrest, making the armrest immovable and slightly reducing seat width. There is no floor storage for this seat during take-off and landing. 48 E None No Power Seat 48 E is an Economy Class Bulkhead seat whose proximity to the lavatories may be bothersome. This center row of seats has two bassinet locations. The tray table is in the armrest, making the armrest immovable and slightly reducing seat width. There is no floor storage for this seat during take-off and landing. 48 F None No Power Seat 48 F is an Economy Class Bulkhead seat whose proximity to the lavatories may be bothersome. This center row of seats has two bassinet locations. The tray table is in the armrest, making the armrest immovable and slightly reducing seat width. There is no floor storage for this seat during take-off and landing. 48 G None No Power Seat 48 G is an Economy Class Bulkhead seat whose proximity to the lavatories may be bothersome. This center row of seats has two bassinet locations. The tray table is in the armrest, making the armrest immovable and slightly reducing seat width. There is no floor storage for this seat during take-off and landing. 48 H None No Power Seat 48 H is an Economy Class seat that may have extra legroom due to the exit row in front, however the close proximity to the lavatories may be bothersome, and passengers may often congregate around or bump this seat during the flight. 5 A None No Power Seat 5 A is a standard Business Premier seat. 5 B None No Power Seat 5 B is a standard Business Premier seat. 5 J None No Power Seat 5 J is a standard Business Premier seat. 5 K None No Power Seat 5 K is a standard Business Premier seat. 59 A None No Power Seat 59 A is an Economy Class seat in the last row of the plane that may have limited recline. The close proximity to the tail of the plane and the lavatories and galley may be bothersome as this can be a high traffic area. 59 B None No Power Seat 59 B is an Economy Class seat in the last row of the plane that may have limited recline. The close proximity to the tail of the plane and the lavatories and galley may be bothersome as this can be a high traffic area. 59 J None No Power Seat 59 J is an Economy Class seat in the last row of the plane that may have limited recline. The close proximity to the tail of the plane and the lavatories and galley may be bothersome as this can be a high traffic area. 59 K None No Power Seat 59 K is an Economy Class seat in the last row of the plane that may have limited recline. The close proximity to the tail of the plane and the lavatories and galley may be bothersome as this can be a high traffic area. 6 A None No Power Seat 6 A is a standard Business Premier seat. 6 B None No Power Seat 6 B is a standard Business Premier seat. 6 J None No Power Seat 6 J is a standard Business Premier seat. 6 K None No Power Seat 6 K is a standard Business Premier seat. 60 D None No Power Seat 60 D is a standard Economy Class seat whose proximity to the lavatories and galley may be bothersome. 60 G None No Power Seat 60 G is a standard Economy Class seat whose proximity to the lavatories and galley may be bothersome. 61 D None No Power Seat 61 D is an Economy Class seat in the last row of the plane that may have limited recline. The close proximity to the tail of the plane and the lavatories and galley may be bothersome as this can be a high traffic area. 61 E None No Power Seat 61 E is an Economy Class seat in the last row of the plane that may have limited recline. The close proximity to the tail of the plane and the lavatories and galley may be bothersome as this can be a high traffic area. 61 F None No Power Seat 61 F is an Economy Class seat in the last row of the plane that may have limited recline. The close proximity to the tail of the plane and the lavatories and galley may be bothersome as this can be a high traffic area. 61 G None No Power Seat 61 G is an Economy Class seat in the last row of the plane that may have limited recline. The close proximity to the tail of the plane and the lavatories and galley may be bothersome as this can be a high traffic area. 7 A None No Power Seat 7 A is a standard Business Premier seat however, the proximity to the lavatories and galleys may be bothersome. 7 B None No Power Seat 7 B is a standard Business Premier seat however, the proximity to the lavatories and galleys may be bothersome. 7 J None No Power Seat 7 J is a standard Business Premier seat however, the proximity to the lavatories and galleys may be bothersome. 7 K None No Power Seat 7 K is a standard Business Premier seat however, the proximity to the lavatories and galleys may be bothersome. This aircraft features OnDemand audio at every seat offering the passenger custom-produced radio channels, and hundreds of CDs including four children's CDs. At every Business Premier and Premium Economy seat, there is an AC power port which does not require a special adapter. There is no power in Economy. On long-haul flights, all passengers receive extensive meal choices and complimentary beverage service. This Air New Zealand Boeing 777-200ER aircraft features a three class configuration with 26 flat bed Business Class seats, 40 Premium Economy seats, and 246 Economy seats. Economy Skycouch seats are featured on this aircraft and are available for purchase at an additional cost. These seats are indicated in blue outline on our seat map. Air New Zealand's description states that the Economy Skycouch is a row of three Economy Class seats that together create a flexible space for whatever you want it to be - an area to relax and stretch out in, or for the kids to use as a play area. It is like having your very own couch on the plane. Business class seats probably worst I have flown. The herringbone configuration is such a bad set up, esp if near a window. They actually face away from window and then one has to watch all the other passengers legs/feet opposite. Very annoying. Seats are tight too. On way to USA from Auckland they replaced with EVA plane (Taiwan) and business class seat much better. Last seat in Premium Economy is the worst. Felt like downgrading to economy mid-flight. You're served last (i.e. you get whatever is left after everyone has selected their meal), your neighbor in the aisle seat has to put away their table in order for you to pass, screens aren't private so forget about watching anything decent next to a kid. Go business or economy. Skip Premium Economy! Air New Zealand are leasing a "scrapyard" Aircraft 772 from Seattle. 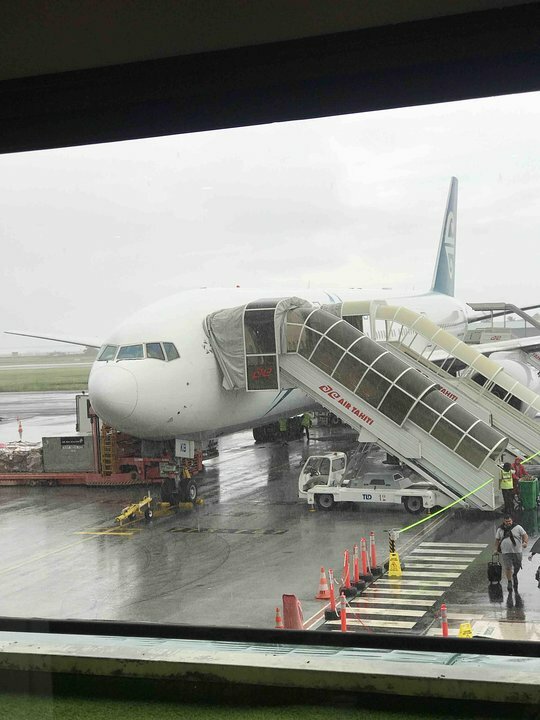 They are running this Aircraft on the Sydney - Rarotonga dn Auckland flights. This Aircraft has "Beetlejuice" as the latest movie, along with "Back to the Future"! The seating is not even Premium Economy standard, mine broken, flying Sydney to Rarotonga. they should NOT sell Business seats on this decrepit Aircraft. NO Premium Economy on Board. The standards of the crew, attitudes, meals and rude could not be bothered overnight flight were atrocious. Unlike i have ever received before from Air NZ. Travellers should avoid this aircraft and flights, and NOT accept this aircraft, change to another or carrier. The standards have dropped dramatically from all i know colleagues and friends, from NZ, and Australia, on this Airline. I will not be choosing them again. Great padding on seat. Good size pillows and blankie . What Air NZ excel at is this PE . Food outstanding for a PE experience as is service from staff as per usual Air NZ high standards, friendly and professional. No one in seat next to me so no disturbance for loo but great pitch so no problem there. These seats are worth each penny they cost. It was indeed possible to have a good rest on the long flight AUKEZE. Practically, it's the same thing as traveling in the initial business-class seats that emerged 30 years ago on DC-10 and 747-200 aircrafts. Even better. Comfortable seat, with minimum disruption from other passengers. Mid-cabin configuration means that other Business Premier passengers either move to the front of the aircraft for restroom, or to the restroom between Business Premier and Premium economy - meaning generally they won't pass your seat. This seat also has views from two windows, one ideal for the lie-flat configuration and the other for the seated configuration. Cabin service was excellent, with the typical semi-casual Air NZ friendly approach. Good meal and beverage choices, with the only are for improvement being the poor filter quality that probably suits North American tastes more than continental. Seat has: - On-Demand T.V - Power (USB connection) - Audio - AUX hole for own headphone (headphone provided) The seat is in a good position. But you cant both people behind as no one sits behind. Seat 6A - Business Premier. I'm soooo glad I wasn't on a long haul flight in this seat because I could feel the passenger in 7A everytime she moved! Whenever the passenger behind you uses the separator for support or as so much touches it, you will feel it. I found this annoying because it seemed like all she wanted to do was sit up, lay down, sit up, sit back, lay down, etc... Note to self: sit in 7A. There are two windows next to this seat. Neither of which are the best alignment. I found 2A to be better but it didn't matter since I blocked out the sun for the entire flight anyway. Premium economy passengers leak in during the flight to use the ONE restroom we have which my fellow Business passengers found bothersome. Food is meh. Non-breakfast options are always better. You only get one piece of toast/pastry??? Talk about stingy. On a positive note, they fill your glass (champagne) before take-off. I personally, wouldn't pay the full fare for a Business class seat on Air NZ. I've never found it to be worth the full price. The only reason I sit here is because it's damn near impossible to get up and use the bathroom in Premium Economy without bothering my neighbour in the aisle seat (I always get a window seat). This flight from Hong Kong to Auckland in Premium Economy was great. The steward in charge of Premium Economy, Shaun, was relaxed but attentive, and always ready for a chat. The seat had great legroom, and it was nice to be able to use the toilets at the front of the Premium Economy cabin, shared with Business class. No diving back through economy cabin to get to the toilet! There was never a queue, either. The food was very good, and lots of wine top-ups! We had full china plates, metal cutlery, and a proper mug for coffee, as well as real cotton napkins. We also had a huge selection of films to watch - the AVOD was superb! Finally, the ANZ safety video is AWESOME - a very cool presentation. Overall, highly recommended. Was moved last minute without being given a choice and was bundled in the middle of the row of four. I'm over 6ft tall and well built and this meant the 8 hour flight from Rarotonga to LAX was awful from a comfort point of view. The service was very good in terms of the food and drink. Best OBE system I have come across and I fly extensively. The pairs of eonomy seats at the back of the ANZ 77-200s are charged extra as a 'preferred seat' but if travelling as a pair, are probably worth the extra. This seat is not recommended for the simple reason that it sticks into the large exit path between cabins and because the curtain is closed, everyone (crew too) continually bump into it. This makes disturbed sleep all night. The seat is very uncomfortable. I found it bothersome that you can't have any bags with you throughout the flight and there is no storage to hold any items, such as books, headphones or anything. Very small seat as well. I consider this seat bad. 2K is the bulkhead Business Premier seat in the front right of the aircraft. If you book it and someone needs a basinette, you may be re-seated but I wasn't and wouldn't think this is common. In a word - FANTASTIC. Service was tremendous. If you ever have Kieran and Rakesh, they'll take fantastic care of you. The seats themselves are wonderful although I wish I could have reclined it myself to 180 vice having to ask a FA. Otherwise, it was superb and comfortable with their added mattress pad. Caution - if you get hot easily - layer your clothing so you can drop into shorts while sleeping. I wore some comfy sweat pants and because airlines (including ANZ) typically raise the temperature to get folks nice and dozy and to facilitate sleep, I cooked. Overall, I loved the flight and the seat configuration and this bulkhead seat was great. There were no issues with the proximity to the galley as they draw a curtain so feel free to move all the way up. I will definitely fly their biz class again!! seats 56 h - k arm rests do not move. Therefore you should be aware that getting these 3 seats in a block are not the best seats to go for. The additional padding on the leg rest for SkyCouch sticks out and prevents the passenger from putting their legs under the seat. It prevents you from being able to bend your knees to 90 degrees or less. I was traveling with a boot due to a ankle fracture and had difficulty getting into and out of the seat. Flew economy AKL-YVR (Vancouver) 13 hour flight. After reading comments about the 10 abreast seating I was prepared for the worst. It's actually not that bad. I'm fairly tall and while the seat is narrowish its reasonably comfortable, the service was good and my wife and I managed 5-6 hours sleep so no complaints. It is economy class folks and for the prices we pay (very reasonable) you can't expect much more. No leg room 48 B felt claustrophobic. Very squashy seat. when 47B reclines you have no space at all you can not stretch your legs and will be required to get up and walk around the plane to avoid swelling legs on the long flight. Flew premium ecomomy AUK to Tokyo with Air NZ. Seat worth every penny compared to flying economy. To be able to actually enjoy the flight and leave the plane not feeling like you've just been through the wringer: Priceless. In economy class the seats are small, this aircraft having the seat arrangement 3 - 4 - 3 makes the aisle small as well. For long haul this becomes uncomfortable. If you happen to end up in this row alone and think you've lucked out and can lay down, think again- the arm rests may not go up, making it next to impossible to do more than squeeze your legs under them and sit with your back against the window - not good for an overnight flight. 47K is a seat Air NZ sells for an extra fee due to extra leg room (no seats in front of you). I think it's pretty cheeky they ask extra $ for these seats as the downside more than makes up for the extra leg room. First, the seats are slightly narrower due to tables in the armrests. In addition to that, the window seat has no window and you are crammed right up against the fuselage due to its curvature near the exit door. There isn't even a full-size armrest there. I was literally squashed up against the wall from shoulder to knee for 14 hours. Also, you are directly next to the toilets (smelly) and the area people line up (noisy). I would definitely not pay the extra money for these again. Nice leather seat with good recline. I felt it a bitt cool at times and despite adjusting the air connection, still had to 'rug up'. My partner and I enjoyed the Business Premier class flight from Auckland to Buenos Aires. The Business Premier lie flat seats ensured a relaxing and restful flight and the service and food was exemplary. It was also a nice touch to have a 'visitors' seat so that we could both dine together. I thoroughly recommend seat 04A and the friendly Business Premier class service from Air New Zealand. This Airline is a class act. My wife and I flu to and from Vancouver recently. We requested seats 59 on advice and didnt regret it. Great seats. Would differently pre book them again. Flight Sydney to Buenos Aires fantastic. The service is 100% better than Lan and the flight hours is less aswel. The planes for Air NZ are clean and very reliable and safer than Lan airlines and cheaper too. Last time flew with Lan both trip return to Sydney ended up with 4 hous delay stuck in a very small dreary airport in Chile. Note, try to stay away from seats suitable for prams and children as these can ge pretty noisy during the night. Two flights AKL-RAR and back. Worst experience of our lives. Packed in like battery hens, no legroom to speak of. And we had to pay EXTRA to book these seats! Service was horrible. Paid extra for meals and got nothing because they ran out of food. Is this any way to run an airline??? I will never fly Air NZ again if I can possibly avoid it. Premium Eco seat: Auckland to Brisbane. This is a better seat than most regional buisiness seats. Lots of space and comfortable. I could see myself being ok for intercontinental journeys if I had this seat. Very fast responsive Entertainment system. Food good quality. Cabin crew friendly. One of the worst flights of my life. Flew RAR to AKL in economy, or what should be described as cattle class. The seats were so close together it was very uncomfortable. There absolutely no ventilation of any kind going on, so it was hot and stuffy the whole way. I will never fly Air New Zealand again. Flying Auckland to Houston and return is a long, tiring flight. Best seats for us were 57a and b. The gap between the seat and window gives a little more room. Took own footstool, which also helped. Economy is tightly packed, so be prepared. I recently flew Hong Kong to Auck as a code share with Cathay Pacific. I found the seat hard and uncomfortable and the width less than on CP flights. The addition of an extra seat in the centre column has reduced the aisle width by a ridiculous amount, making it impossible for crew members or pax to pass without banging into aisle seated passengers. flight from Hong. The seat configuration of 3x3x3 on Cathay's own planes is far superior to that of Air NZ. Clearly CP values the comfort of its passengers unlike Air NZ whose only interest is increasing profit. I will never fly Air NZ on long haul again. I fly between Canada + NZ at least once a year and have been flying back & forth with Air New Zealand for 30 yrs. The new seats and features are in my opinion the best I have ever seen on any flight. I am 6'1 and 250lbs and found the seat, legroom + comfort to be excellent. Best flight ever, slept very well for about 8 hrs of 12 hr flight. I truly can't understand the complaints. I took this plane from Sydney to Auckland. The plane was super nice and beautiful. The width of the seat was actually surprising because of the 10 seats int the row, but it was so hard, that even 3 hours seemed long. I can't imagine a longhaul flight in these seats. Also it's hard to see, that ANZ is like a low cost airline, i understand, that it wasn't a long flight, but it was bit pricy, and they asked extra for even a sandwich! Just got off from SFO to AKL NZ7 and this seat layout is a torture chamber. Hard seat, poor incline, poor leg room with the forward seat floor mount pressed into your left leg, narrow isles causing crew members, and other pax to constantly bump into you . This causes a sleep deprivation nightmare. Air NZ I see is setting up their seats 10 across in the 777 where I see their competitors Hawaiian, Virgin Australia (using other aircraft types) are nine across. Do the math (More room). I will never fly with Air NZ again, even if it take longer via Australia, or Hawaii. This economy class seat is utterly wrong for an 11.5 hour flight - it is too narrow for normal size people to sit in comfortably. This seat arrangement of 10 seats across a 777 is an outrageous imposition upon an unknowing public, and a nasty, penny-pinching move of terrible greed by Air NZ. I will never fly such an Air NZ aircraft again. The Premium Economy on the 787 and 777-200 aircraft is a vastly superior product to that in the 777-300 (The Spaceseat) These 'normal' seats are very comfortable, have adequate recline, in seat power and exceptional IFE. I'm taller than most, and I found these seats more comfortable that the Business Class Seat. On balance for a single sector flight of up to 10 hours I would choose PE over Business on this aircraft. This was the most uncomfotable flight i have ever been on. The seat was so tiny and hard, hardly any recline either and as a flight departing auckland at 23.50, was a 10 hr ish flight you needed to sleep on it. In my opinion these planes should not be 10 seats across. Air New Zealand flies 1 versions of Boeing 777-200 NL.